Two years have passed since British voters decided—by a 52-48 margin—to leave the EU. More than 15 months have passed since the UK informed the EU of its intention to leave. More than a year has passed since the negotiation of a withdrawal agreement began. In less than nine months the UK will leave. And in order for the member states and European Parliament to have sufficient time to review and approve the agreement prior to the exit date—March 29, 2019—the negotiation must be completed by the European Council’s October 18 meeting, or its December meeting at the very latest. In short, the Brexit clock is ticking and time is running out, raising fears in the EU, the British Parliament and the business community of a “no deal” outcome—no withdrawal agreement, no transition period until 2021, only the crash landing of the hardest possible Brexit at midnight on March 29, 2019. It was with that sense of urgency and fear, coupled with its continued frustration with the pace of the negotiation, that the European Council returned again to Brexit on June 29. And it was with that same sense of urgency and fear that the British government met last Friday at Chequers, the prime ministerial country house, to decide on the future economic relationship with the EU it will seek in the negotiation. At the European Council meeting, after hearing from Michel Barnier, the EU’s chief negotiator, about the state of play in the negotiation, the 27 leaders—British Prime Minister Theresa May doesn’t participate in discussions about Brexit—quickly and unanimously agreed on the Conclusions presented for their consideration. While welcoming the further progress made since their March meeting on parts of the legal text of the 129-page draft withdrawal agreement, the leaders expressed their concern that “no substantial progress” has yet been achieved on a “backstop” to ensure that the border between Northern Ireland and Ireland remains open in all future circumstances and insisted on “intensified efforts” in that regard. And they stated that work must be “accelerated” on the preparation of a political declaration on the framework for the future relationship—something that “requires further clarity as well as realistic and workable proposals from the UK as regards its position on the future relationship.” That declaration will accompany and be referred to in the withdrawal agreement. Regarding the Irish border, Ireland and the EU have made it clear from the outset that the withdrawal agreement must be compatible with the overarching requirements of maintaining and protecting the 1998 Belfast Agreement and, in that spirit, must ensure that the border between Northern Ireland and the republic remains open and frictionless and the rules and regulations concerning trade between the two parts of the island remain aligned as they are now in the EU’s Single Market and Customs Union. In March, the negotiators presented a draft Protocol on Ireland/Northern Ireland the terms of which will be annexed to the withdrawal agreement and will apply unless and until the UK and the EU reach an agreement that addresses the unique circumstances on the island. One of the most important sections of the protocol is chapter 3 on the “common regulatory area” comprised of the two parts of the island. There is, as yet, no agreement on the text of that chapter. The EU has said a “legally operative version” of the “backstop” must be agreed as part of the protocol. A second-best alternative that would ensure that the border between Ireland and Northern Ireland will remain open and trade between the two will remain frictionless, while also avoiding creation of a trade barrier between Northern Ireland and the rest of the UK, would involve the UK as a whole either remaining in the EU’s Customs Union (the Monaco model) or negotiating a bilateral customs union with the EU such as Andorra, San Marino and Turkey have. In early June, the UK proposed a “time-limited” “temporary customs arrangement” between the EU and the whole of the UK until a future permanent customs arrangement could be introduced. In the temporary arrangement, all tariffs, quotas, rules of origin and customs processes, including declarations, on UK-EU trade would be eliminated and the UK would apply the EU’s common external tariff at its border. Although the UK didn’t specify a termination date for the temporary arrangement, it said it expected the permanent arrangement would be in place by the end of 2021. But that arrangement clearly falls far short of what is required in order to address the “backstop” issue. For one thing, as Barnier noted immediately, it doesn’t provide for the full regulatory alignment of Northern Ireland with the rules of the EU’s internal market required by the UK’s commitment to establish a “common regulatory area.” Also, because it is “time-limited,” it would not ensure an open border in all future circumstances. And, he said, the “backstop” can’t be extended to the whole UK because it was designed for the specific situation of Northern Ireland, and what might be feasible for a territory the size of Northern Ireland wouldn’t be feasible for the whole UK. In regard to the UK’s future relationship with the EU, at the December meeting of the European Council, Barnier told the leaders that, in light of the UK’s “red lines,” the obvious model is the Comprehensive Economic and Trade Agreement (CETA) the EU agreed with Canada in October 2016. But in her Mansion House speech in early March, Theresa May said the UK wouldn’t seek a free trade agreement similar to Canada’s because that would reduce the access of the EU and UK to each other’s markets. Instead, it wanted the “broadest and deepest possible partnership – covering more sectors and cooperating more fully than any Free Trade Agreement anywhere in the world.” Such an agreement, she said, would encompass not only goods but financial services, would include reciprocal binding commitments to ensure fair and open competition and would create an independent arbitration mechanism, a process of dialogue and consultation in which EU and UK regulators would work together, and a comprehensive system of mutual recognition of regulatory standards for goods with a mechanism to oversee the arrangement. The agreement would, she said, allow the EU and UK access to each other’s financial markets based on a collaborative framework that is reciprocal, mutually agreed, permanent and maintains the same regulatory outcomes over time. There would be either a customs partnership with the EU or a highly-streamlined customs arrangement in which the EU and UK would agree on measures to minimize trade frictions. After the March meeting of the European Council, the EU issued its negotiating guidelines, reiterating its view that, in light of the UK’s “red lines,” it was prepared to work toward a “balanced, ambitious and wide-ranging free trade agreement” once the EU was no longer a member state. But it noted that such an agreement couldn’t offer the same benefits as membership and amount to participation in the Single Market or parts thereof. And it made it clear there could be no “cherry picking” through participation in the Single Market on a sector-by sector approach. According to the guidelines, the FTA would address trade in goods with the aim of covering all sectors and maintaining zero tariffs and no quantitative restrictions. It would address trade in services with the aim of allowing market access under host state rules, including in regard to the right of establishment for providers, consistent with the fact that the UK will be a third country and will no longer share a common regulatory and judicial framework. And there would be appropriate customs cooperation while preserving the regulatory and jurisdictional autonomy of the parties and the integrity of the EU Customs Union. In May, the UK negotiating team gave the EU a document outlining its vision of one aspect of the future relationship—the “economic partnership.” That “partnership” would be broad—covering more sectors than any other FTA, ranging from agriculture and fisheries products to financial services; deep—breaking new ground in the depth of mutual market access; and balanced—including reciprocal commitments to ensure open and fair competition. It would include a system of mutual recognition to prevent non-tariff barriers and support trade in goods; minimize barriers to trade in services and investment; provide mutual market access for financial services; and include a new customs arrangement that would maintain zero tariffs. It would include reciprocal binding commitments to ensure fair and open competition, including the EU’s rules regarding state aid and competition. There would be an overarching institutional framework that would include a means for the leaders and ministers of the UK and EU to exercise political oversight, provide direction to the development of the future relationship, make whatever decisions might be necessary in regard to changes in the relationship, and ensure parliamentary accountability. There would be a “joint committee” that would take direction from those exercising political oversight to manage the processes of regulatory cooperation, make sure the agreement is operating effectively, and propose changes as necessary. And there would be “robust governance arrangements” to deal with regulatory cooperation, possible non-compliance, monitoring and enforcement, and dispute resolution. It was the government’s elaboration of that partnership that was the subject of Friday’s 12-hour meeting at Chequers. In the statement it released at the conclusion of the meeting, it said that, while its vision for the future relationship remained sound, its position needed to “evolve” and it had therefore agreed to a “more developed and comprehensive” proposal, at the core of which is the establishment of a “free trade area for goods” that would avoid friction at the border and ensure that both sides meet their commitments to Northern Ireland and Ireland. While the proposal will be spelled out in detail in the White Paper on the future relationship that will be published Thursday, the government summarized the four main elements of the proposal: 1) The UK and EU would maintain a “common rulebook” for all goods, including agri-food, with the UK committing by treaty to ongoing harmonization with EU rules on goods that cross the border to ensure frictionless trade, while agreeing to different arrangements for services that would allow regulatory flexibility; 2) The UK and EU would ensure a fair trading environment by incorporating “strong reciprocal commitments related to open and fair trade” into the legal agreements that define the future relationship. The UK would commit to applying a “common rulebook” on state aid and establishing “cooperative arrangements” between regulators on competition. And it would maintain the current regulatory standards for the environment, climate change, employment and consumer protection; 3) The UK and EU would establish a “joint institutional framework” to provide for the “consistent interpretation and application of UK–EU agreements by both parties,” with that done in the UK by UK courts but with due regard paid to EU case law in areas where the UK continued to apply a common rulebook. The framework would also include “robust and appropriate means for the resolution of disputes,” including through a “Joint Committee” and, in many areas, “binding independent arbitration” that, “through a joint reference procedure” would “accommodate” the role of the ECJ as the interpreter of EU rules; and 4) The UK and EU would work together on the phased introduction of a new “facilitated customs arrangement” that would remove the need for customs checks and controls between the UK and the EU “as if a combined customs territory.” The UK would apply the UK’s tariffs and trade policy for goods intended for the UK and the EU’s tariffs and trade policy for goods intended for the EU. In addition, the proposal states the UK will leave the Common Agricultural Policy and the Common Fisheries Policy, will conduct an independent trade policy, and will end free movement, although there will be a “mobility framework” so UK and EU citizens can continue to travel, work and study in each other’s territories. The mention of a “common rulebook,” “ongoing harmonization with EU rules,” “strong reciprocal commitments,” “cooperative arrangements,” a “joint institutional framework,” “due regard paid to EU case law,” “robust and appropriate means for the resolution of disputes,” a “joint committee,” “binding independent arbitration,” a “joint reference procedure,” etc. will no doubt lead many in the UK and throughout the EU to wonder why, if the UK really wants all that, it wants to leave the EU. More immediately, for many proponents of Brexit in the Conservative Party, the terminology and content of the proposal suggest the government has betrayed the 52 percent who voted to leave the EU and has instead embraced not only a “softer” Brexit but a “soft” Brexit—one in which the UK will remain subject to EU rules, regulations, laws, and authority. 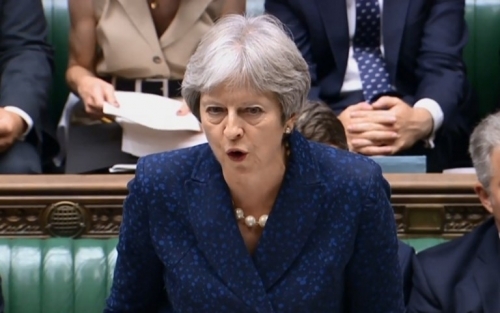 At Chequers, Theresa May invoked the “collective responsibility” of the government and made it clear that any minister who could not support the decision would be expected to resign. It initially appeared that everyone, including those who wanted a “harder” Brexit, accepted the government’s decision. But a few days later, two of the leading Brexiters resigned from the government—David Davis, the Secretary of State for Exiting the EU, on Sunday and Boris Johnson, the Foreign Secretary, on Monday—as did a junior minister and a couple of parliamentary private secretaries. In his resignation letter, Johnson coined a new hyphenated term, saying the UK was heading for a “semi-Brexit, with large parts of the economy still locked in the EU system, but with no UK control over that system.” Meanwhile, as Theresa May defended the government’s decision in the House of Commons Monday, rumors circulated that some Conservative backbenchers were planning to write the chair of the party’s 1922 Committee of backbenchers to request a vote of confidence in the prime minister. It’s unlikely there will be such a vote and even more unlikely, should there be one, that Theresa May would lose. But clearly the government has been weakened in the aftermath of Chequers. Next Monday, the withdrawal negotiation will resume in Brussels. The proposed framework is a negotiator’s nightmare, both for the UK and for the EU—so complex in its institutional structure and the varying relationship between the UK and EU across the various domains of policy that it will be very difficult—indeed, perhaps impossible—for the UK and EU to conclude a withdrawal agreement in the few months remaining that would allow sufficient time for it to be reviewed and approved by all parties and take effect by midnight on March 29, 2019, thereby avoiding the crash landing of the UK economy that would occur in the hardest possible Brexit—a “no deal” Brexit. Perhaps the time has come for the UK to realize there is a far safer and far simpler option than its proposed economic partnership—membership in the EEA, which would allow it to be unambiguously outside the EU but unambiguously still in the Single Market and Customs Union.